The newspaper box is in front of Milligan Flowers on Main Street. Howard Hewitt, Bachelor Advisor – The Student Voice of Wabash College got a little bigger audience today and not just for the Back to Campus issue. The Bachelor, in it’s 104th year, started a Back to Campus Issue five years ago. Each year the student newspaper is inserted into Crawfordsville’s Journal Review. The idea is to share with the community not just the start of another school season but Wabash news. For the past several years, Bachelor staffers have talked about having a distribution point in town. This spring members of Crawfordsville Main Street’s Engage Wabash Committee asked the Bachelor to being downtown distribution. The box was also added at the request of advertisers. Dean of Admissions Steve Klein serves on the Main Street committee along with a student representative. With the help of Crawfordsville Realtor Rusty Carter, a newspaper box was put in place this week just in time for the Back to Campus issue. Bachelor distribution will now include the downtown box for each issue. The Bachelor staff published its award-winning Back to Campus paper today. The staff begins its usual Friday publication schedule beginning Sept. 9. Jim Amidon — After months of meetings, planning, programming, designing, recording, and writing, today is launch day for the newly designed Wabash College website. We greet this day with a little anxiety and a lot of pride in the collaborative work that’s gone into bringing about this new website. We made the choice to do all of the work in-house, which meant using our best people to the best of their abilities — challenging them to add the project to their already full to-do lists. The focus of the new site is prospective students, their families, and the public. We hope the new wabash.edu home page shows people the real face of Wabash College — our mission and those qualities that make Wabash distinctive in a higher education landscape filled with look-a-like colleges and universities. The home page will feature videos from students, faculty, and alumni telling their stories and sharing their successes. Our Voices page will include blogs from students, faculty, and staff, The Bachelor, This Week in Wabash Sports, and Chapel Talks and other videos from our YouTube channel. The new Academics pages, while still in construction, put our majors and faculty front and center. The Wabash faculty are consistently ranked among the nation’s most engaging and most accessible professors. Now you can learn more about those people whose work with students in and out of the classroom changes lives. The new student life page provides a nice snapshot of the ways in which Wabash men live their lives — in service to the community, leading clubs, playing sports, and governing themselves in accordance with the Gentleman’s Rule. The new Admissions and Financial Aid pages are still developing, but we think they’re much more user-friendly and will serve prospective students and their families even better than before. For folks within the Wabash community, the new myBash page (accessed from the top of the home page) will take them to easily accessible links to webmail, Moodle, the scheduler, and all of the tools and resources we use daily as we live and learn at Wabash. The new Alumni Office page is another that will evolve. It includes our amazing alumni blog, and within our Alumni Voices page, you’ll find links to blogs written by alumni from all eras, all across the globe, covering an amazing range of topics. NAWM President Greg Castanias has committed to updating the alumni with a video message each time he returns to campus. Finally, the Sports site has undergone a big transformation. This is the one part of the overall Wabash site for which we chose a partner. Using Sidearm Sports, one of the nation’s leading sports information software companies, we’re presenting the Little Giants in a whole new light. Among the many features of the new sports site are much improved social media sharing, deeper roster information, and the ability for fans to watch the Little Giants, purchase photos, and have the latest information as it happens. A project of this magnitude could not have been completed without incredible leadership and management of Brad Weaver and Howard Hewitt, slick programming by Mark Siegel and Tyler Koch, beautiful design by Kim Johnson, and, of course, Brent Harris’ non-stop attention to the details of the sports site construction. Along the way, our work has been guided by a committee comprising Jenn Abbott, Lexi Hoerl, Dan Rogers, Bob Royalty, Chad Westphal, Chip Timmons, Tosh Everson, and students Kenny Farris and Paul Liu. And these are just a few of the people whose work made this new site possible. It’s amazing that virtually all of this was done with our own people — working at their best with a Wabash Always Fights attitude. Sure, there will be hiccups along the way as we transition well more than 100,000 pages of stories, tools, photos, and resources. There’s a lot of work to be done. But at this moment early on a Friday morning on the eve of Freshman Saturday, I’m proud of my colleagues and their commitment to giving Wabash a fresh face on the world wide web. 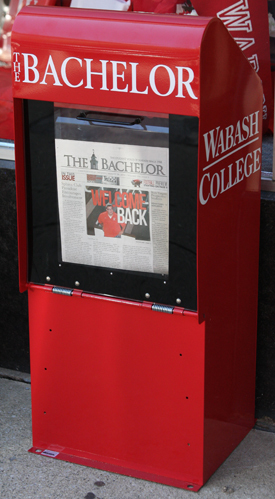 By the time you read this, 200 Wabash College students will have arrived on campus signaling the start of another school year. Coach Erik Raeburn welcomed over 140 football players to training camp, which began Sunday and continues through this week. Soccer Coach Roberto Giannini has a senior-laden team working out at the new Mud Hollow Stadium. Cross country runners will get their physicals today, international students are starting orientation, and the men who will lead freshman orientation will be in training this week, as well. The 2011-12 school year at Wabash College is officially underway. By this time next week, all of the freshmen will be on campus getting registered for classes and learning their way around the Wabash community. Next Monday afternoon, all of the freshmen — and it’s a whopper class pushing 300 new students — will be spread out in Montgomery County doing service projects. Classes begin a week from Thursday. This is always an exciting time of the year. Upperclassmen are anxious to get back to campus — tired of summer jobs, internships, and living at home. Sophomores are glad they are no longer freshmen. And the new guys are anxious in a different way — nervous about whether they’ll like it here, if they’ll fit in, make the varsity, pledge the fraternity, and succeed in classes. One group of Wabash freshmen has a head start on all the others. Professors David Hadley and Doug Calisch are taking 15 men west to Montana for a before-the-year-begins Immersion Learning trip as part of a Freshman Tutorial. Professor Hadley did this a few years ago — taking freshmen to Yellowstone and surrounding parts — and it was a smashing success. Perhaps the happiest person on campus is soccer coach Roberto Giannini. Now in his sixth year, Coach Giannini has a large senior class, a brand new field (Mud Hollow Stadium), and 14 home matches. The transformation of old Mud Hollow to the new facility is simply stunning. There are stadium seats for nearly 200 fans, restrooms, and a FieldTurf Pro playing surface. Just opposite the soccer field is a newly sodded field for intramural and recreational sports. The football players sweating through difficult practices this week hope to build on last year’s 8-2 season, which ended in a thrilling 47-0 win in the Monon Bell Classic. If everyone shows — including more than 60 freshman players — the squad could be pushing 150 athletes. The Little Giant football team opens on the road September 10 at Wooster, a team that will already have played a game. Wabash’s home opener against Ohio Wesleyan is Community Day the following weekend. Finally, Wabash will welcome a bumper group of international students in the freshman class. This is a tough week for those young men, many who come to Crawfordsville from China and Vietnam. These are guys from cities with millions of citizens and public mass transit, who will arrive in a county with fewer residents than their neighborhoods. David Clapp and his volunteers do an excellent job of helping our international students adjust to life at Wabash, and you’ll probably see them walking about downtown, opening bank accounts, and stocking up at Walmart. When you do, reach out to them, say hello, and welcome them to our city. It seems like just yesterday when President White rang out the Class of 2011 and now we prepare to welcome the men of 2015. It’s a big class filled with men from all over the country and around the world, who will be changed forever next Saturday when they are rung in as Wabash Men.